Decision trees are a common model for software applications, but how are they used in combination with machine learning? Let's take a look. Machine learning is a buzzword in the technology world right now. It is fun, challenging, puzzling, and even a bit scary if you’re one of those people who believes robots will someday steal our jobs and rule the world. Whether we like it or not, we are surrounded by adaptive smart things that can fix some of our most common daily queries in a split second. Machine learning was embodied in the famous Skynet from the Terminator franchise. Some are afraid of this fantasy becoming real, while some are excited about a whole new world of opportunities we’ll get in the AI world. Sure, this future AI may want to eradicate the entire human race... but for now, we can achieve much more than we can even imagine with it. Google self-driving cars, Facebook face recognition, Amazon recommendations, speech recognition with Siri and Cortana, fraud detection by PayPal... the list is long and growing! So, that was a brief intro into ML. Now, let’s look into decision trees, one machine learning technique. Simply put, a decision tree is a tree in which each branch node represents a choice between a number of alternatives and each leaf node represents a decision. Decision trees learn and train themselves from given examples and predict for unseen circumstances. ID3 stands for Iterative Dichotomizer 3. The ID3 algorithm was invented by Ross Quinlan. It builds a decision tree from a fixed set of examples and the resulting tree is used to classify future samples. The basic idea is to construct the decision tree by employing a top-down, greedy search through the given sets to test each attribute at every tree node. Sounds simple — but which node should we select to build the correct and most precise decision tree? How would we decide that? Well, we have some measures that can help us in selecting the best choice! In information theory, entropy is a measure of the uncertainty about a source of messages. It gives us the degree of disorganization in our data. Here, p+ and p- are the proportion of positive and negative examples in S.
Consider this entropy function relative to a boolean classification, as the proportion of positive examples p+ varies between 0 and 1. Notice that the entropy is 0 if all members of S belong to the same class. For example, if all members are positive (p+ = 1), then p- is 0, and Entropy(S) = -1. log2(1) – 0. log2 0 = -1. 0 – 0. log2 0 = 0. The entropy is 1 when the collection contains an equal number of positive and negative examples. If the collection contains unequal numbers of positive and negative examples, the entropy is between 0 and 1. It measures the expected reduction in entropy. It decides which attribute goes into a decision node. To minimize the decision tree depth, the attribute with the most entropy reduction is the best choice! Let’s see how these measures work! Suppose we want ID3 to decide whether the weather is good for playing baseball. Over the course of two weeks, data is collected to help ID3 build a decision tree. The target classification is “should we play baseball?” which can be yes or no. We need to find which attribute will be the root node in our decision tree. For each attribute, the gain is calculated and the highest gain is used in the decision. Clearly, the outlook attribute has the highest gain. Therefore, it is used as the decision attribute in the root node. 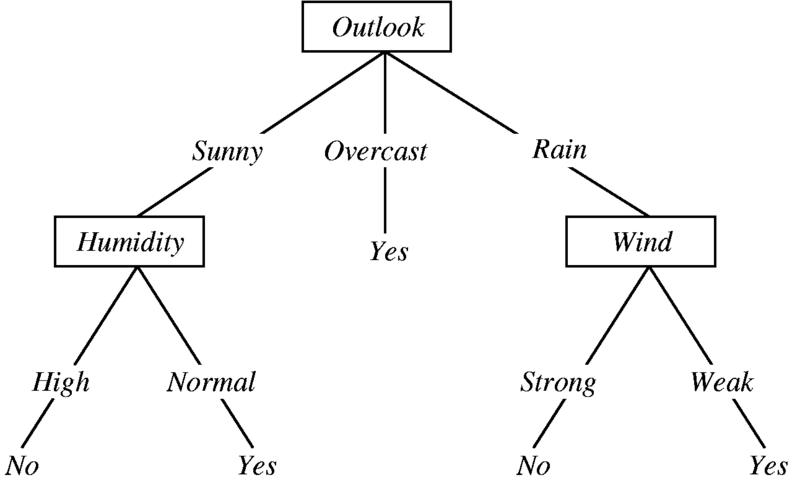 Since outlook has three possible values, the root node has three branches (sunny, overcast, rain). The next question is, What attribute should be tested at the sunny branch node? Since we've used outlook at the root, we only decide on the remaining three attributes: humidity, temperature, or wind. Humidity has the highest gain; therefore, it is used as the decision node. This process goes on until all data is classified perfectly or we run out of attributes. So, that was a very quick intro to decision trees. It’s as simple as depicted above. I hope this article helps you! Published at DZone with permission of Ramandeep Kaur , DZone MVB. See the original article here.